Tanking of below ground structures is an essential part of the building process, and one of the most expensive to rectify should something go wrong. The tanking of your building should be, but is often not considered and settled on very early in the design process. By mixing waterproofing, aggregate and a variety of drainage systems you can protect your below ground structure from leaks essentially for the life of the building. Tanking membranes are installed depending on available access. We always prefer to use torch applied bitumen based membranes for below ground tanking as they are more durable than the alternatives, are much faster to install and have proven themselves high quality performers for many years. 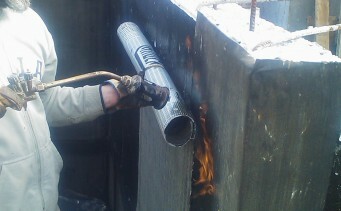 The downside to using a torch applied membrane is access. We need to have around a one metre clearance between the wall to be tanked and the side of the excavation. The excavation also needs to be stepped back or shoring installed to prevent collapse. We also need to backfill regularly where the depth below ground is over one and a half metres. Where access or excavation is an issue we can prefabricate Butyl Rubber panels which can be lowered into the excavation from above. When using Butyl Rubbers a polyester geotextile protective layer is often required between the structure and the rubber for protection.